Another early Easyjet departure but a smooth flight, a short train ride and we were in our hotel in Berlin by lunchtime. Having hoped for real Winter weather we were a little disappointed to find Berlin was experiencing the same mild grey days as London. Still it was dry so no complaints really especially as it stayed that way for the three days we there. After being allowed to check in early it was off to get our bearings. We were staying at the Ibis Hotel Potsdamer Platz which was picked in line with our standard requirements – free wifi, location and price. The room was basic but clean (all you need when you don’t intend spending any time there!) and the hotel was conveniently located between the Brandenburg Gate and Checkpoint Charlie. 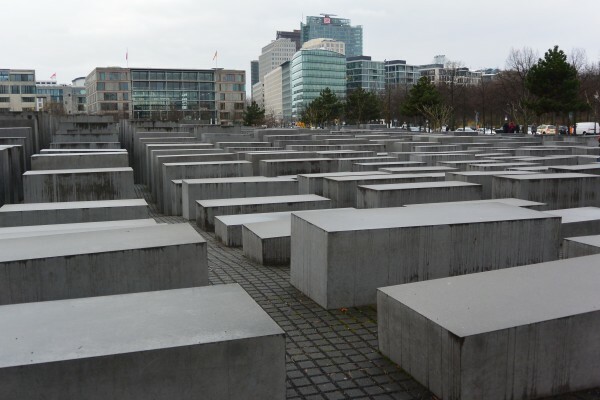 First stop was the Memorial to the Murdered Jews of Europe, an area of various sized grey blocks built to commemorate the Jews and others murdered in the Nazi concentration camps. 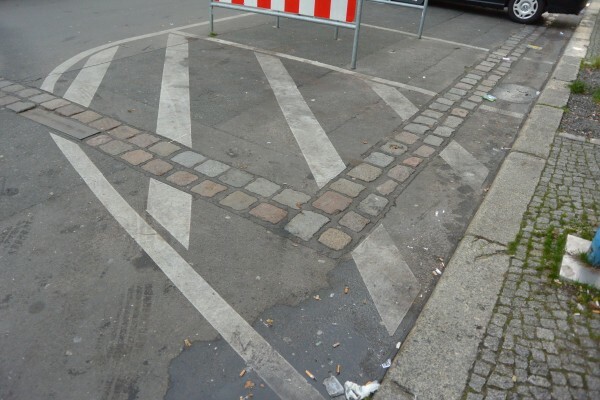 One thing we liked about Berlin was that it has not tried to hide its history but has used it as to bring about change – far more thought-provoking than simply sweeping it under the carpet. From there it was on to the Brandenburg Gate where we grabbed a quick spot of lunch, the Reichstag (book online a few weeks ahead to be able to go up inside the Sir Norman Foster Cupola) and then we just wandered around until we reached the Gendarmenmarkt and our first taste of a real German Christmas market. As it was custom we had to partake of the Gluhwein and the markets here all sell their drinks in commemorative glasses for which you pay a €3 deposit and then it’s your choice if you take them back or keep as a souvenir. 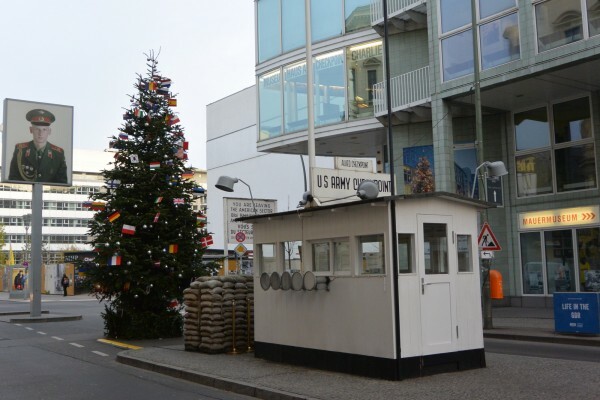 Checkpoint Charlie had always been on Bob’s to do list so that was our final destination for the day (the 3.30am start and Gluhwein were taking their toll!) but it was too dark by the time we arrived to see too much so it was back to the hotel for an early dinner and bed. We ate in the hotel that night which had a reasonably priced restaurant serving a good selection of food. CharlieOut early the following morning in the glorious sunshine to stop back at Checkpoint Charlie where one of the original guard huts still remains along with some signage. For many the fall of the Berlin Wall is a moment many of us remember as well as the proceeding rhetoric of the Cold War which makes the history so accessible.The Wall is marked throughout the City by a line of cobbles and signs, it is hard to comprehend the difference in the lives of those living either side. 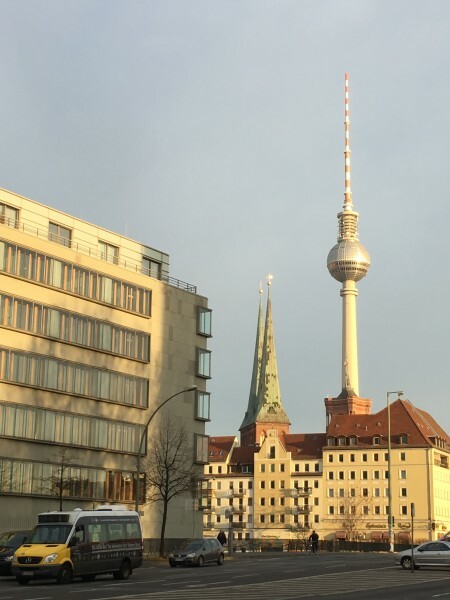 The early start was to get us to the Berliner Fernsehturm, a 368m high TV tower and the tallest building in Berlin. We’d picked up last minute tickets online the night before but had to be there at 10am before general opening which in hindsight was the best move as by the time we left around 10.45, the queues to get in were getting rather long. We only went to the viewing platform and since found out that the restaurant on the floor above rotated but given the bright morning we had great views over the City. 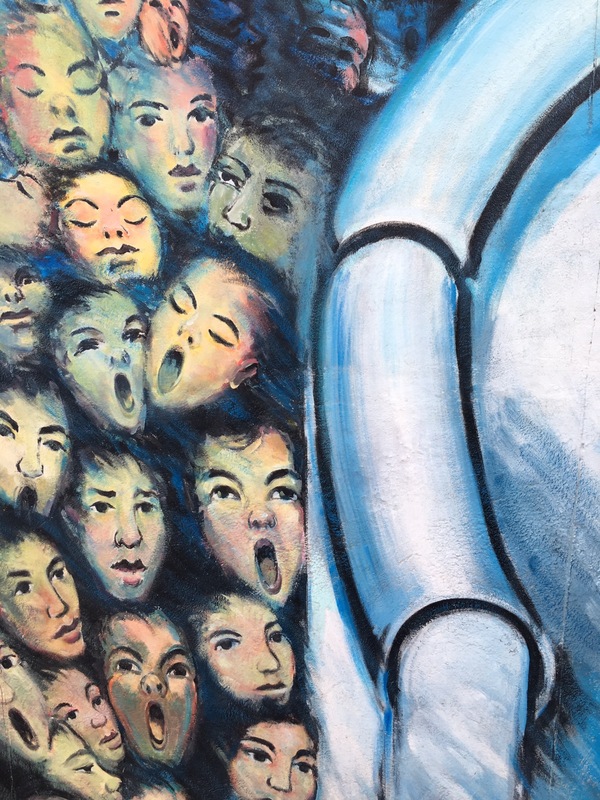 The next stop was the East Side Gallery, one of the original sections of The Wall still standing but now covered both sides in grafitti. More Christmas markets and Gluhwein around Alexanderplatz before a quick trip back to the hotel for a nap (another early start!) 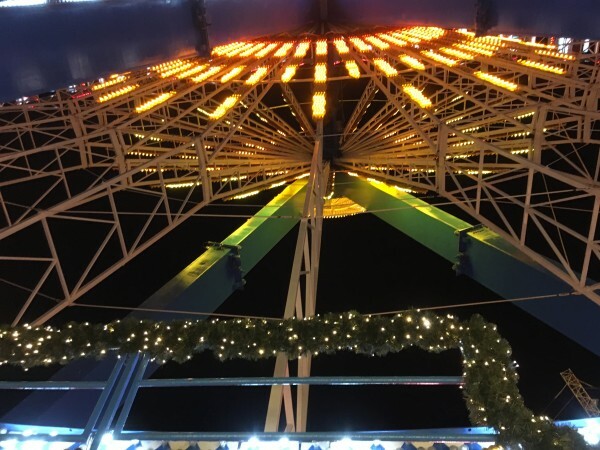 and then returning to the market by the Berliner Rathaus, a beautiful red brick building for the evening, for a spin on the Ferris Wheel and severe calorie overload from the food available on the stalls. 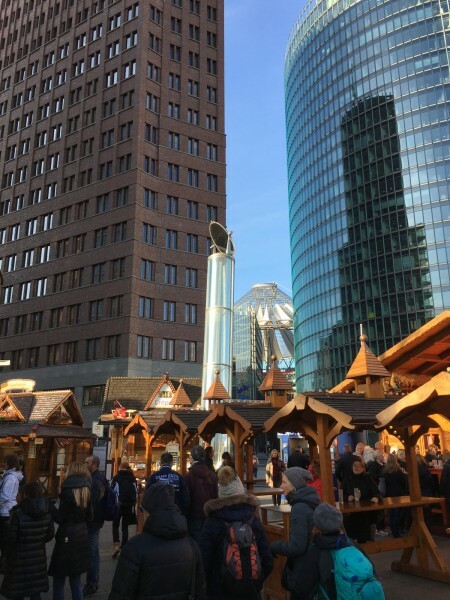 Our final day was spent around Potsdamer Platz, a total contrast to the grand historical buildings that make up much of this part of the City. Most of the shops there can be found in any European shopping centre but the trip up to the Potsdamer Point viewing platform via the fastest lift in Europe is well worth it for views over the city. Lots of bars and restaurants although we didn’t visit any. 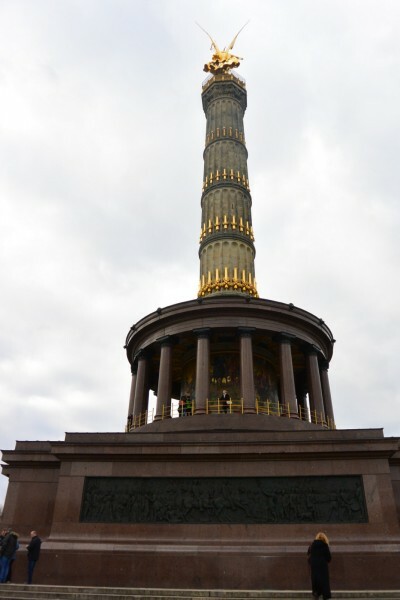 For some peace and quiet we strolled through the Tiergarten, a large wooded area to the west of the City, to the Siegessaule, the rather blingy monument originally erected to signify Prussian military victories. €3 and 285 steps will get you to the viewing platform at the top and again worth if for an entirely different view back over the city. Again, despite thoughts at one point that the monument should be dismantled, it hasn’t been and the area is now used for public celebrations including a New Year’s Eve party. 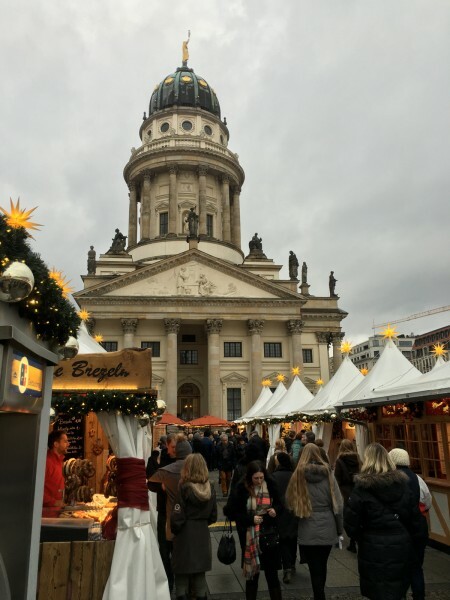 So another wonderful weekend away although with only three days we barely scratched the surface of Berlin but we did the highlights and visited the markets. Safe to say we will be back!